A customer from Shandong(China) operated a stone quarry for dressed stone. 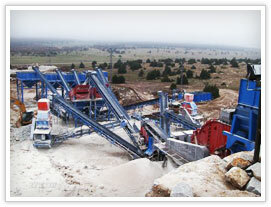 however，many chips which are extremely cheap come from the crushing process. As time passed, the chips was piled up taking us a large area.He asked engineers of SBM to solve this problem. Engineers reformed the production line and suggested a sand making machine VSI8518 for him to process chips into sand with a capacity of about 40t/h as well as designed the sand making plant for him .This design not only solved the chips space waste problem, but also brought great profit. It also won the customer a proferencial policy for exemption of sand making VAT because of its national leveled energy saving and emmission saving standard. Unitll mow, SBM have designed sand making production line for thousands of clients from more than 60 countries and serviced for field of sand making and sand shaping for more than ten years. Not only in the operating factor of material, but also in the engary saving, SBM has been at an international leading level.